UDM Downloads > MP3 Workstation! decoding and playback of MP3 (Mpeg layer 3) compressed audio. CD audio can be extracted and encoded to the MP3 format. MP3 files can be decoded to WAV format for playback on standard audio players. The integrated database can be used to sort, filter, search, and play MP3 files. Groups of songs can be loaded and saved as song sets for quick load into the player. The program includes an integrated editor that allows you to create colourful information in Rich Text Format, including photos. 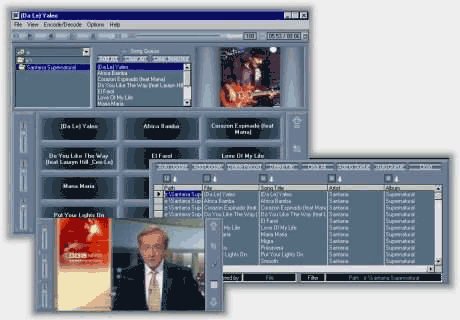 Media Box uses the CDDB Disc Recognition Service from CDDB, Inc. to get the artist, title, track, credit, and other information about the CD's you play and encode. Software Features: Playlist - Now with improved easy playlist creation. NEW ! CD Audio Grabber CD to WAV, MP3, auto ID3 Super fast batch encoding. File Encoding WAV to MP3, MP3 to WAV Xaudio, Direct Sound Dual Stream DJ Mixer - Fade in/out/overlap mixing between songs CDDB2 free enhanced disc recognition service - get all the information about your audio CD and save it to the encoded file. Look up CDDB info from MP3 file. Music Browser - visit web sites with information about your audio CD, including artist sites, fan clubs, TV appearences, tour guides, album cover images and more. Rich Text editor adds photos, lyrics etc. linked to songs or song directories. Volume, Treble, Bass, Speed controls - save treble/bass/speed settings for each song. Comprehensive database with auto-update, auto-song set, auto ID3, search, filter, play. Auto search for files and add only new ones to the database. File Manager - automatically creates directories for your files using CDDB info. Create quick load song sets Song queue ordered or randomized. Song or song set repeat. Choice of players. Now with changeable graphical user interface designs ( skins ) Karaoke - create karaoke style highlighting lyrics.